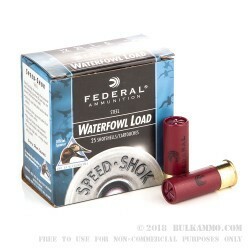 This 12 Gauge shell by Federal has a host of features that will help you shine while bird hunting. It has a high-density plastic wad with a gas sealing flange which will convey as much energy into each load as possible. 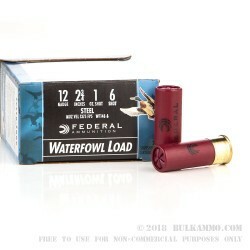 It has a primer designed to work reliably even in moist environments, so you won’t miss a shot regardless of the weather. Its shot is hard and perfectly round, so it will resist deformation while traveling in the barrel to give you tight, effective patterns. These are all a part of Federal’s commitment to excellence, which it has subscribed to for nearly one century. 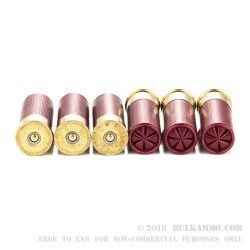 Notably, this shell is loaded with one ounce of #6 steel shot. 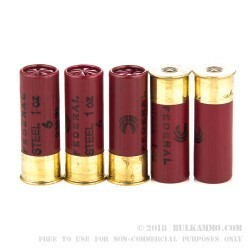 It is totally compliant with state and federal laws that ban the use of toxic ammunition in some areas, so you’ll be able to go after ducks and other medium to large birds in sensitive environments with impunity. The law aside, it’s satisfying to keep that beautiful habitat pristine for birds to thrive in, even if it means trading away with a little power and penetration in exchange. We certainly want the ducks to be happy -- at least while we’re not hunting for them, that is!